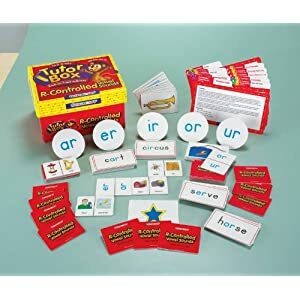 We’ve just added a new teaching kit: the R-Controlled Vowel Sounds Tutor Box. According to the teacher card, activities are differentiated to address various learning styles-tactile, kinesthetic, auditory, and visual. All activities are designed to fit into a time frame of 10-20 minutes. Some activities are best for one student while others work well with 2 or more students. Activities are not sequential- they may be used in any order desired- and are designed to be used with an adult or upper-elementary helper.